On November 23, 2016, Slovenian president Borut Pahor became the first head of NATO nation who had the honor to address Iranian Majlis (parliament). Before becoming president of the country in December 2012, Pahor was prime minister of Slovenia (2008-2012) and Speaker of the country’s parliament. Pahor placed a wreath at Imam Khomeini mausoleum. 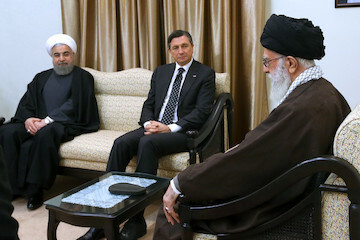 Later Pahor accompanied by Iranian president Dr. Hassan Rouhani (photo above) paid a visit Iran’s Supreme leader Ayatullah Ali Khamenei. During the meeting with Ayatullah Khamenei, the Slovenian president said he had held very good talks with senior Iranian officials and expressed his country’s interest in deepening relations with Iran in all fields. For his part, Ayatollah Khamenei said that Iran and Slovenia enjoy great potentialities and capacities to bolster cooperation and expressed hope that the future would back up the Tuesday talks. Last month. Slovenia started burying the remains of 800 Slovenians killed by the invading Russian army during the WWII. “It is our human and state duty to bury in a civilized way the victims of war and post-war killings,” Borut Pahor said at the burial ceremony in the northern second city of Maribor. The ceremony was also attended by Croatian Prime Minister Andrej Plenkovic. Ottoman Turk armies passed through the present day Slovenia on their way to Vienna, but it was never occupied by Muslims. In the last century, Slovenia became part of Yugoslavian kingdom. Slovenia declared independence from the former Yugoslavia on June 25, 1991, and after a masterful 11-day campaign forced the Serbian war machine away for good. It joined the United Nations on May 22, 1992 and applied for EU membership June 10, 1996. Slovenia joined NATO on March 29, 2004. A great majority of Slovenians support Palestinian struggle against Jewish occupation, but the government as part of European Union supports Israeli occupation, and even buys arms from the Zionist entity. Former Israeli president Shimon Peres visited Slovenia in 2010. Pahor returned the visit as prime minister in 2011, and discussed Palestinian issue with Benjamin Netanyahu. Muslims, mostly Bosnian and Albanian, make 50,000 in country’s total population of 2.1 million. There are nearly 400 Jews in country’s capital Ljubljana. “Last month. Slovenia started burying the remains of 800 Slovenians killed by the invading Russian army during the WWII.” What a lie. Russians had nothing to do with the killings of Slovenians. It was all done by Yugoslavian Serbian communists.